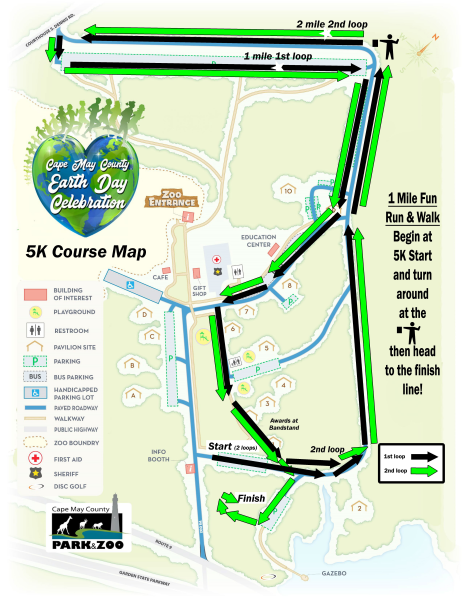 Register for the 5K Earth Day Race today! Set for Saturday, April 20 from 8:30 a.m. to 4 p.m., the day will start off with a bang with a 5K Earth Day Race and 1 Mile Fun Run. The pre-registration donation of $20, or $25 the day of the race. T-shirts will also be handed out to the first 150 participants. This event benefit the Cape May County Park and Zoo Trust Fund. Certificates will be awarded for the top three finishers in each age group in both male and female divisions. In addition to the race, live music, children's storytime, inflatable obstacle course & slide, an interactive drum circle, hands-on educational exhibits, free entertainment, guided nature walks, food and crafts are all on the agenda.